Ghana would soon be importing timber from neighbouring countries, CEO of Domestic Lumber Trade Association of Ghana (DOLTA), Mr. Kofi Afreh-Boakye has hinted. He said this is in order to bridge the demand-supply gap on the domestic market. According to FAO, local consumption of wood products shows a rising trend. It projects that by 2020 the total domestic requirement of lumber in Ghana would be 1.517 million m3 round wood, which is equivalent to over 2.15 million m3, assuming a recovery rate of 40%. After aggregating export and domestic demands, FAO concludes that the total future demand for round wood is equivalent to 3.35 million m3. 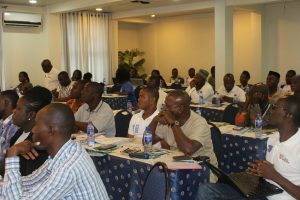 Speaking at Forest Watch Ghana’s 2017 2nd General Meeting, in Larteh in the Eastern Region, Mr. Afreh-Boakye said that DOLTA had commissioned a research to explore how feasible importation of lumber for domestic consumption will be. “The goal is to establish sustainable market for timber in the country,” he said. He expressed the hope that the introduction of FLEGT will curb the menace of illegal logging. Huge volumes of illegal chainsaw lumber are exported annually across the borders of Ghana resulting in inadequate supply of lumber to the domestic market. To solve this problem, Ghana has signed a Voluntary Partnership Agreement (VPA) with the European Union with an obligation to export legal timber and also ensure that the domestic market trades in legal timber. Going forward, VPA countries will issue FLEGT licences to suppliers as proof of exporting legal timber to Europe and other continents. Ghana is yet to issue a FLEGT licence.